*미국 현지 정품을 항공으로 직배송 드립니다. *미국현지에 다음주 제품입고예정으로 배송기간은 14일~19일(영업일기준) 소요되십니다. 100% Isolate Protein Matrix. Protein per Serving 25 grams. Fast & Slow Digesting Isolate Matrix. Naturally Occuring EAAs per Serving. Syntha-6 Isolate Ingredient Highlights: IsoLast Isolate Protein Matrix- Consists of: Fast and slow release proteins for a moderate release of Amino Acids. Whey Protein Isolate. Milk Protein Isolate (~80& Casein & ~20% Whey). Naturally occuring BCAAs and other essential and non-essential Amino Acids. EFAs & Fiber Blend (Inulin & Polydestrose). 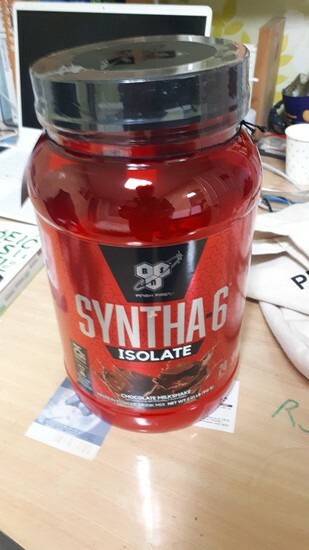 Same great Syntha-6 Milkshake taste and texture. Stack with Nitrix 2.0, N.O. Xplode 2.0 and Cellmass 2.0 for maximum physique and performance impact. Directions: Take 1 scoop with 4-6 oz. of cold water or any beverage of your choice. To increase your protein intake per serving and to achieve an amazing milkshake taste, use non-fat or low fat milk. Warnings: Before consuming Syntha-6 Isolate seek advice from a physician if you are unaware of your current health condition, have any pre-existing medical condition, taking any medication, planning any medical procedure, contemplating pregnancy, pregnant or nursing. Reduce or discontinue use if any adverse reactions occur such as but not limited to gastrointestinal discomfort. Syntha-6 Isolate is only intended to be consumed by healthy adults 18 years of age and older. Keep Out Of Reach Of Children and Pets. Store in a dry place away from direct sunlight. Allergen Information: Contains Milk And Soy (Lecithin) Ingredients. SYNTHA-6 is an ultra-premium protein powder and BSN's best-tasting protein on the market. SYNTHA-6 not only includes essential amino acids and essential fatty acids, but is also an excellent source of fiber and contains 6g of fat per serving, which makes it a nutritious and multi-functional protein supplement. SYNTHA-6 is the go-to protein for any nutrition or exercise regimen because it is designed to suit a variety of active lifestyles and diet plans. And with SYNTHA-6, the high standard of quality protein comes with taste to match, thanks to BSN's exclusive flavor technology. 처음에 바닐라맛을 주문했는데 바닐라맛이 미국입고가 지연되는 상황이 발생하여 제품을 초코맛으로 바꿨습니다. 그러자 바로 발송완료가 되어 빠르게 제품을 받아볼수 있었습니다. 받은 제품에 하자가 없고 매우 만족합니다. 그리고 상담해주신분도 친절했습니다. 만족합니다. 환불 받으실 계좌 070-4100-9390으로 문자주시거나 게시판에 남겨주시면 바로 환불처리 진행드리도록 하겠습니다. 주문진행 도와드리지 못해 정말 죄송합니다. 그리고 말씀하신 리뷰에 대한 부분은 구매자분들께서 직접 구매하시고 남겨주신 소중한 후기들로 저희측의 조작이라는 등 오해가 없으시길 바랍니다. 미국에서 진행가능한 제품을 구입하신 경우 대부분 4~6일내 수령이 가능하시구요, 네이버페이 리뷰는 네이버에서 관리하는 부분으로 저희가 임의대로 관여할 수 있는 부분이 아님을 알려드립니다. > 조상우 님께서 쓰신글 입니다. > > 세상에 입금확인이 3일걸리고 배송이 일주일지나도 안오는건.. > 물론 2주까지 걸릴수있다라고 나와있긴한데 > 딱 2주걸려 올듯 > 아니 오기라도하면 다행인거같기도하고 > 암튼 이건 그렇다쳐도 > 입금확인은 왜 3일씩이나 걸리는지 > 시간에 여유가많은분들만 여기서 구매하기실 > > 그리고 네이버페이에서 작성된 리뷰들 > 딱봐도 주작질 쳐 하고있는거같은데 > 주작을 칠꺼면 좀 티안나게 하던가..